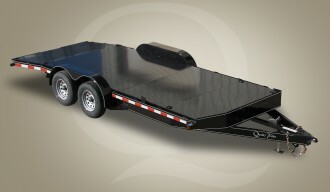 Economy Series Diamond Deck Car Trailers are built with a 4″ channel frame and 4″ channel wrap-around tongue. Running gear is spring suspension 3,500 lb. axles with radial tires. This trailer is available with one brake axle or two brake axles. A full diamond deck with 4′ dovetail and stud-mounted lighting are standard. There is no reflective tape on Economy models. The ramps are 5′ long and slide in to tracks from the rear of the trailer. This model is available in 16′ and 18′ lengths. General Duty models upgrade to a 5″ channel main frame with 4″ channel wrap-around tongue and 3″ channel crossmembers. Running gear is spring suspension 3,500 lb. axles with 4-wheel brakes and radial tires. The ramps are 5′ long and slide in to tracks from the rear of the trailer. A standard 4′ dovetail, a full diamond deck, rubber mounted sealed beam lighting, and skip reflective tape are standard. General Duty models are available in 16′, 18′, and 20′ lengths in 7,000, 8,000, and 10,000 GVW ratings. Professional Grade Car Trailers are manufactured with an all tubing 5″ main frame and wrap-around tongue on the 7,000 GVWR model and an all tubing 6″ main frame and wrap-around tongue on the 8,000 and 10,000 GVWR models. 3″ channel crossmembers on 16″ centers are standard on all GVWR’s. The running gear is spring suspension 3,500 lb. axles with 4-wheel brakes and upgraded radial tires. The ramps are 5′ long and slide in to tracks from the rear of the trailer. A standard 4′ dovetail and a punched traction surface on the ramps ensure safe loading in all conditions. A US made sealed wiring harness with all LED lighting and full reflective tape comprise the upgraded lighting package. This model features both stake pockets with rub rails and d-rings on the floor for easy tie down of your valuable car. Professional Grade models are available in 16′, 18′, and 20′ lengths in 7,000, 8,000, and 10,000 GVW ratings.